A teenage boy is in danger, cornered in an alley. A fist flies into the back of his head and steals a Cola from his backpack. The fist belongs to our protagonist, Kenan Kong, a bully. Kenan is the son of a mechanic, his victim, Luo Lixin, is the son of a well-to-do airline CEO. In trying to escape the frying pan, Lixin falls straight into the fire. Blue Condor, one of Shanghai's first "American-style" super-villains, appears out of nowhere, grabbing Lixin. Blue Condor is known to periodically terrorize the rich and powerful. People like Lixin, not Kenan. Though every instinct tells Kenan to run, he hurls the Cola at Condor, who drops Lixin, fleeing. Lixin is so overwhelmed with gratitude, he hugs his longtime bully and asks how he can repay him. Kenan doesn't need a moment to consider; he asks for all the cash he has on him. Lixin doesn't hesitate and promises he'll bring him more tomorrow. A young woman by the name of Laney Lan recorded Kenan's heroic moment on her cellphone. She is a reporter for Primetime Shanghai, she conducts an impromptu interview on the spot as her camera crew assembles. Kenan resists his engrained habit of insulting Lixin on camera, flexes his muscles, and tells the world of his "sense of duty" towards his fellow classmate. Before leaving, Kenan asks Laney out on a date, and is promptly shot down. Riding high from his star treatment, Kenan heads to his father's auto repair shop, but is quickly deflated. His father has already seen the viral video and is not impressed. He will not stay for an in-depth interview with Laney. He has a meeting with fellow dissident writers working to uncover the existence of an evil shadow department of the government known as the Ministry of Self-Reliance. He says, Truth, Justice, and Democracy are more important than any one individual, and he will not take part in a news spectacle to generate television ratings. Dejected, Kenan visits his mother's grave, she died years ago in an airplane crash. (Yes, the same airline that Lixin's father works as CEO). Kenan is accosted by Dr. Omen, an employee of the Ministry of Self-Reliance. (She first appeared in The Final Days of Superman storyline). She tells him that the ministry has found a way to replicate Superman's abilities - in the right person. They believe that right person to be Kenan. In a laboratory, Kenan is outfitted with a snug containment suit and put into the Origin chamber. With the flip of a switch and a jolt of electricity, a reoccurring dream flashes before Kenan's eyes. His mother's airplane is plummeting to Earth. The only difference: he is dressed as Superman. Not realizing he is dreaming, Kenan bursts out of the chamber exuding solar power in an attempt to save his mother. As he comes back to reality, he is enamored with his newfound powers. When he doesn't feel the need to listen to Dr. Omen's instructions, she calls for backup. Kenan is ordered to stand down or be brought down by the Bat-Man and the Wonder-Woman of China. Story - 5: Upon my first read-through, I assumed Yang's plan was to use some conventional superhero tropes, while turning others on their head. But then I saw him in an interview. 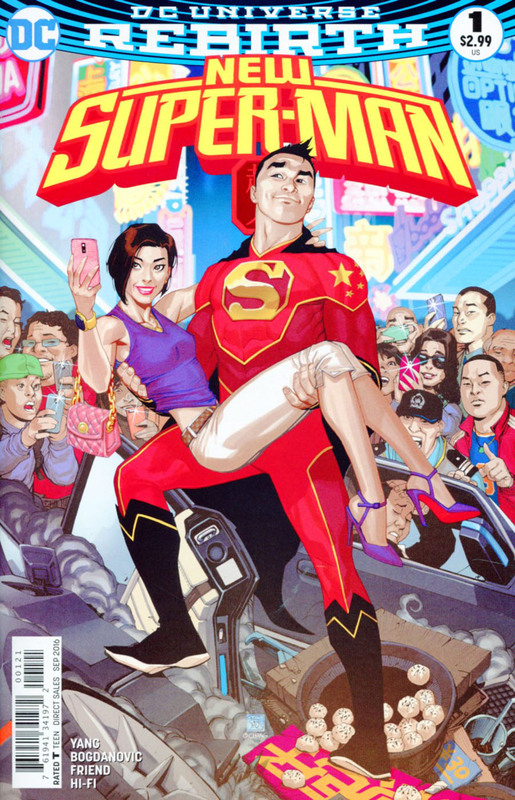 It turns out that his portrayal of Kenan Kong as a jerk and a bully wasn't meant to flout Superman and his "golden moral standard," as Yang put it, but mirror Superman's original character arc. According to Yang, in 1938, Superman began as "kind of a jerk, arrogant, [overly] confident," and someone who "made fun of people who couldn't figure out his secret identity." We know that Superman's attitude changed, and it should be no spoiler to hear Yang confirm that Kenan will change for the better, also. Personally, I have always thought that Superman's early portrayal was a simple way of conveying his power and passion, while giving a sense of immediacy to the given threat. But Yang's interpretation does guarantee his new hero will not be saddled with any kind of "Chinese boy scout" tag. 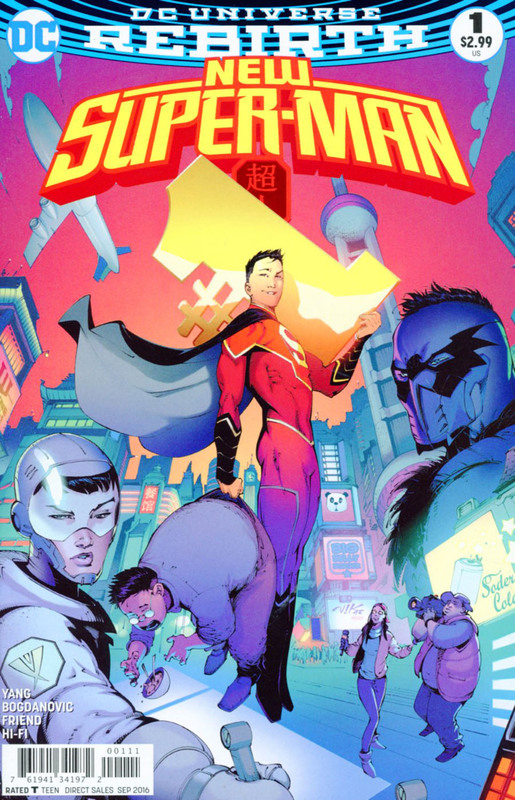 And since, DC seems awfully concerned about worn out jokes and snide comments that have been perpetually lobbed at the character, (Hence, the acing of the red trunks) this jarring origin is an oddly perfect way to introduce this New Super-Man. There will always be pressure to 'fix' or modernize Superman, to make him tougher or darker. But from Wolverine's loner attitude, to Batman's the Dark Knight Returns, the Punisher's trail of dead bodies, or Deadpool's irreverent humor and comical healing ability, the standard of 'cool' is ever changing. But I do not begrudge the 'bully origin' for Kenan Kong, in fact I applaud it. A new, teenaged member of the Superman family is the perfect place to apply the current group-think ideas of what it means to be a modern superhero. (Remember Superboy's leather jacket, shaved head, and hippy sunglasses?) Like Kon-El before him, Kenan Kong can serve as a barrier, protecting the real Man of Steel from fads and here-today-gone-tomorrow trends of the day. As far as story quality, Yang is a good writer, and it shows. Like TV pilots, first issues are tough. They need to accomplish a lot in a limited amount of space. Here, we get an unforgettable introduction to our main character, a life changing confrontation with a super-villain, and establish a side-kick, love interest, disapproving father, shadowy-organization-turned-employer, and the main character's backstory and motivator all in a tight twenty pages. Yang is committed to building a world that seems (excuse the cliché) 'lived in.' The book takes us to a place that most of us are not familiar with, shows us villains we have not seen, while connecting us back to Superman with Dr. Omen, super-friends, and the hope that comes when a person is given abilities far beyond those of mortal men. Art - 4: Time and time again, when writers are asked what they look for in a good artist, the answer most given is facial expressions. If there is one thing that stands out about Viktor Bogdanovic, it's that. Add in his character's body language, and the art goes a long way in helping tell the story. On the down side, he is inconsistent. Some parts look rushed, he seems to lack a certain polish. His backgrounds are usually well done with the appropriate level of detail. Bogdanovic is fairly new to the comic book world, with some work he could be a top-shelf artist. Cover Art - 4: The cover is a bit busy. But perhaps, it is appropriate for a new hero. In one shot, yes, we see the character's world, supporting cast, and villain, but we also see an unfamiliar red sky filled with Asian architecture. The low camera angle emphasizes the size and density of the city. Even Kenan holding an oversized "#1" conveys that this is not just a rebooted comic, but something wholly new.